Yay for snow! - To grrr, or not to grrr? That is the question. It's been ages since we've seen any significant snowfall in the area here. It's still coming down and should continue for another few hours. Radar showing some heavier bands on the way. Working from home since the roads are pretty bad. Already several accidents between my home and I-40, so forget that. I'm sure I could get in, but it's everyone else I'm worried about smashing into me. Edit/update: NWS just upgraded us (Durham County) BACK to a Winter Storm Warning for up to 8" as of 0950. You SAY you're going to work from home, but we all know you'll be out playing in the snow. Make a snow angel for me. Oh, I'm working. Already had to put out one fire that flared up this morning. Not entirely since I'm actually working. It's nice though. NWS is now calling for up to 8". May it also help to alleviate your drought conditions too! As much as I have muttered curse words at our snowfall, I know it will lead to higher lake and river levels in the Spring! Yay. Central NC has been out of the drought for many months now unlike Charlotte and northern Georgia. NWS now calling for up to 8". Be safe, and enjoy the beauty! Oh, I'm enjoying and it keeps getting better as the NWS is now calling for up to 8". Come to Rochester, there's endless amounts. Wow, it's nice to read someone excited about snow again! Up here, we've been getting hit very regularly of late, so we've gotten either blase or annoyed at it. 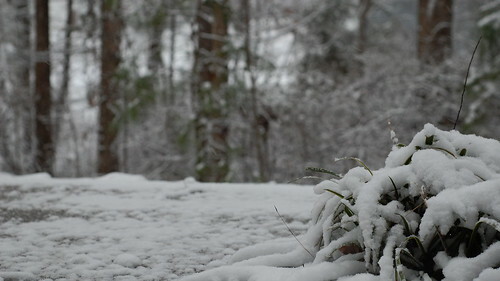 But getting snow in NC, especially in a drought, is pretty darn awesome, so yay you guys! Well, not everyone gets excited about it. Many people hate it with a passion. I, OTOH, love it. No drought here--that ended many months ago. Charlotte area and northern Georgia are still under a severe drought though. I think parts of VA are still too, at least according to my Dad. He said that the lake from the Dirty Dancing filming had dried up. Wow, that is a lot of snow for you guys. It takes less than in inch of snow to turn the DFW Metroplex into a complete mess. Oh, 1" will do it here too hence all of the accidents all over the place. Even the governor today called a state of emergency and told people to stay home.